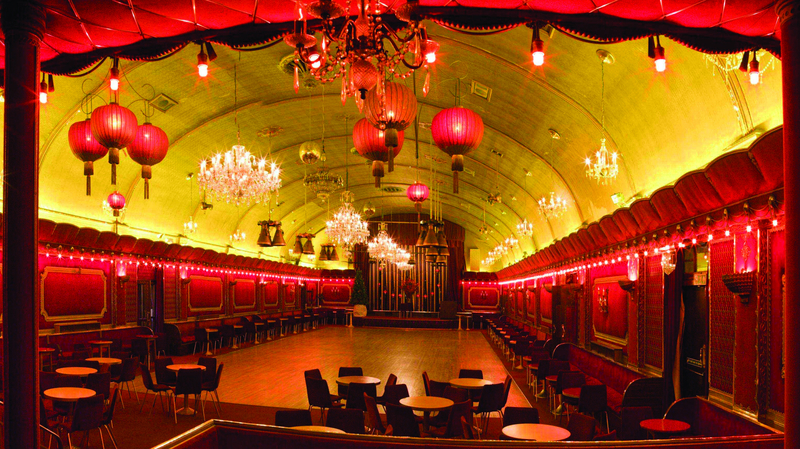 When it comes to going out in London, it’s easy to stick to our favourite hangouts. Whether it’s a cosy pint at your local, brunch at a neighbourhood bistro, or partying hard into the small hours, we’ve all got our usual stomping grounds. But while we are creatures of habit, sometimes it’s good to mix things up. 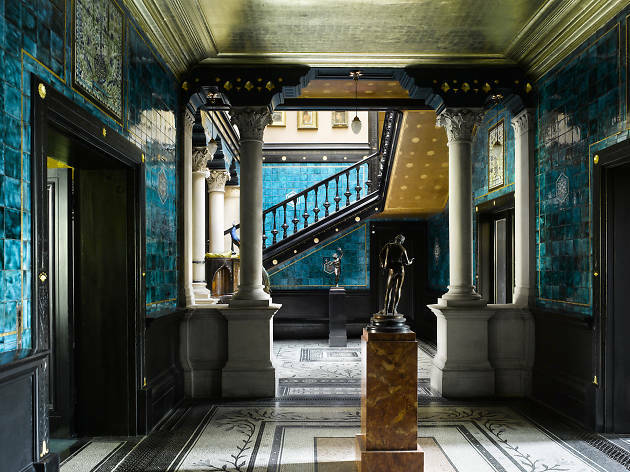 Luckily for us, London is full of fascinating escapes that will shake up your routine and make you feel a million miles from the capital. From traversing the wilds of the Scottish Highlands to white-water rafting down the Zambezi, try something new with our pick of places in London that look nothing like London. 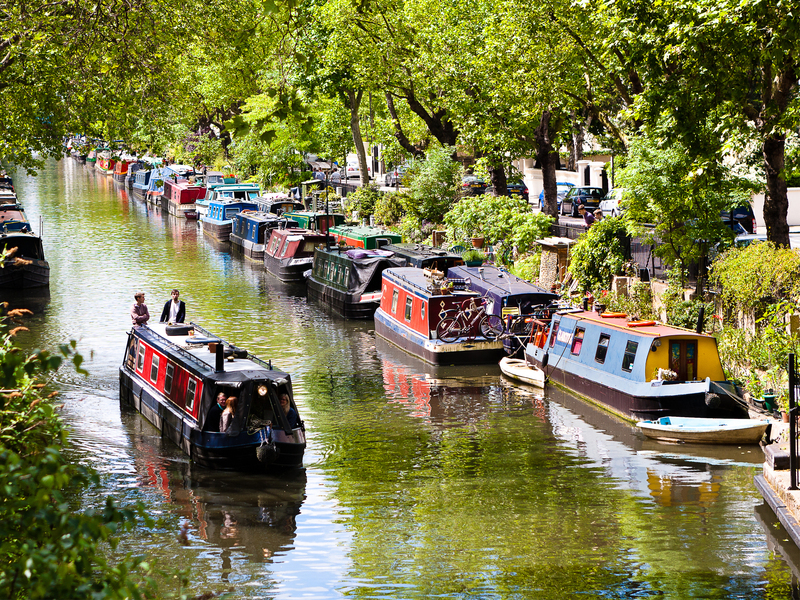 With this lot on your doorstep, you’ll never have to leave the capital again. Probably. Cruising down a Venetian lagoon in The Floating City of love and bridges. Exactly! Who needs a gondola ride when they can they can sail through London’s most picturesque narrowboat haunt? This tranquil spot, just north of Paddington, packs in just as much romantic charm as its Italian counterpart. Why not treat yourself to a cruise up the river in one of the quaint narrowboat tours, or enjoy a spot of water-borne theatre on the Puppet Theatre Barge. Rialto Bridge, eat your heart out. Traversing the wilds of the Scottish Highlands with the red deer. 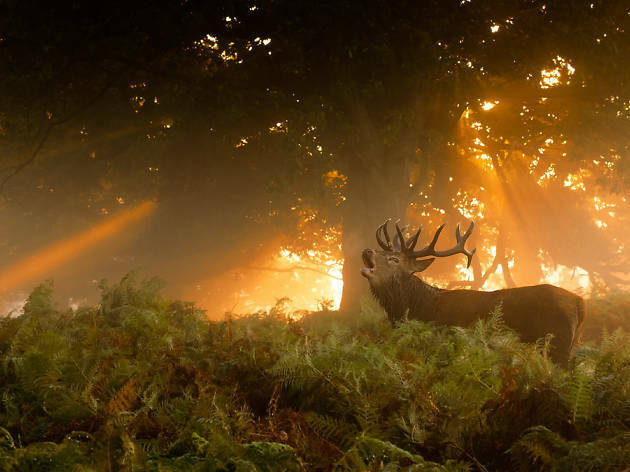 Yes, you’d be forgiven for thinking you’d stepped into the land of bagpipes and haggis at Richmond Park’s National Nature Reserve and Deer Park. At almost 2,500 acres it’s almost three times the size of New York’s Central Park and its rugged foliage houses no less than 630 red and fallow deer, which have roamed the grounds freely since 1637. 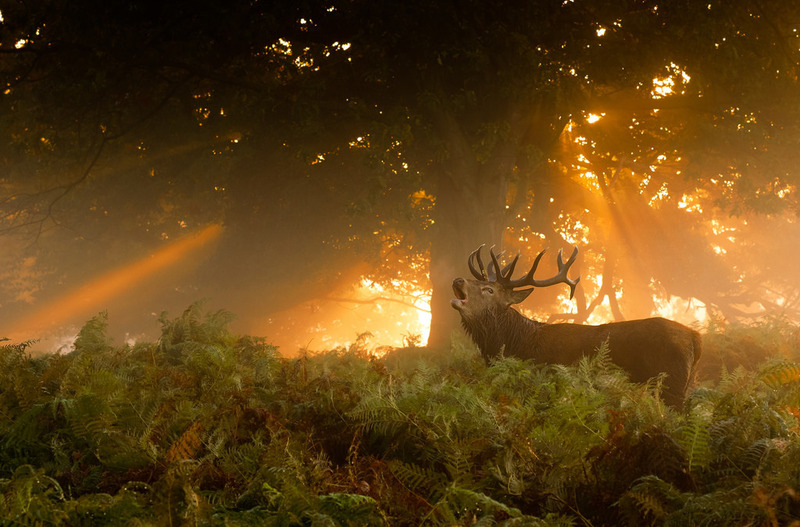 During autumn, you may catch glimpse the heated effects of the deer ‘rut’ (or breeding season) when stags roar and clash their antlers to win a mate. It’s better than an evening in with an Attenborough doc. Marveling at Dutch architecture in a flower-filled field in Holland. I thought we just passed Brockwell Park? We may still be in Zone 2, but that won’t stop you missing out on ogling at a bit of Dutch-style engineering. Ashby’s Mill or ‘Brixton Mill’ was standing tall in Lambeth even before Queen Victoria was a nipper. It supplied wholemeal flour to West End hotels and restaurants until 1934 before it fell into disrepair. 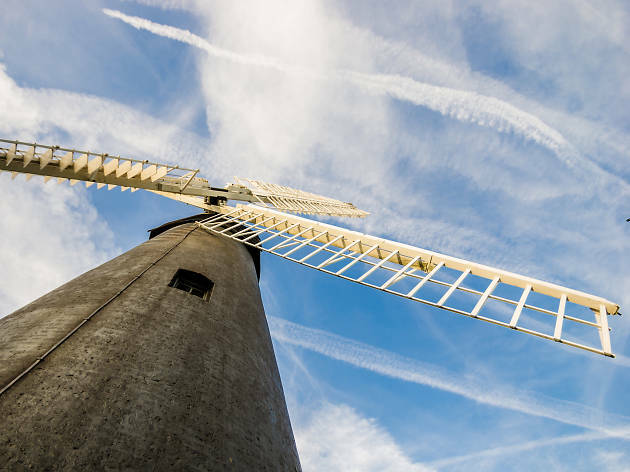 It’s since been treated to a £60,000 restoration and you can now snoop around all its nooks and crannies in one of the mill’s regular tours. 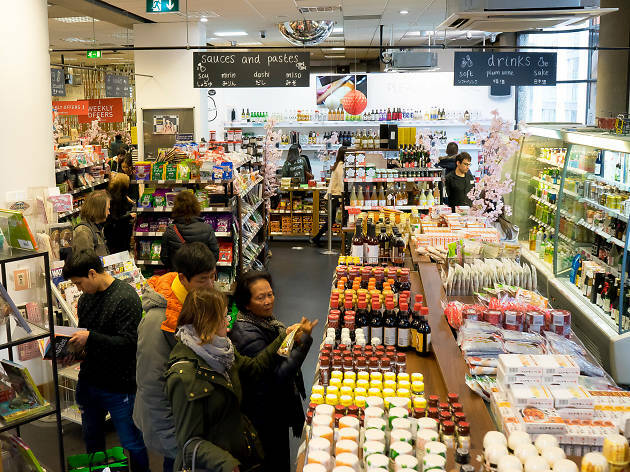 You can even buy freshly ground flour there when you visit - Brixton flour anyone? Finding your inner Zen in a Japanese garden. But I can still see the Shard?! Okay, so you haven’t quite made it to east Asia. 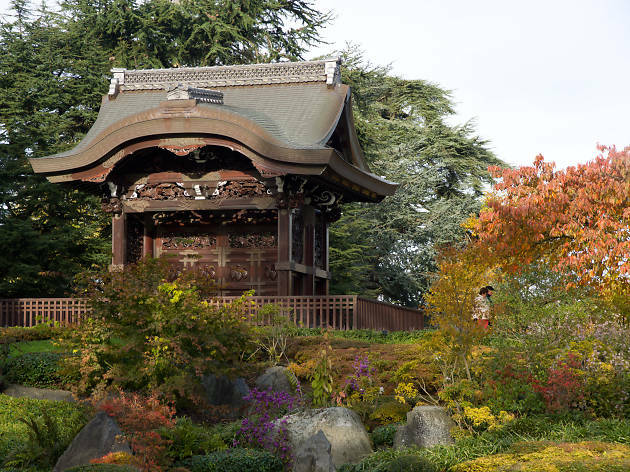 In fact, you’re in the perfectly sculpted Japanese Landscape at Kew Gardens. The neat bonsais and shrubs make for a scene straight out of a willow pattern plate. Take in the ornamental Japanese Gateway, a replica of the Karamon gateway at Kyoto’s Nishi Hongan-ji temple, the stone baths, rustling bamboo, rocky out crops and spring-time blossoms. Who needs Kawachi Fuji Gardens, eh? Following in the footsteps of Brian Blessed by scaling Mt Everest’s icy climes. But I got here on the Piccadilly line! Yep, you can have your very own extreme mountaineering experience right in the heart of Covent Garden. 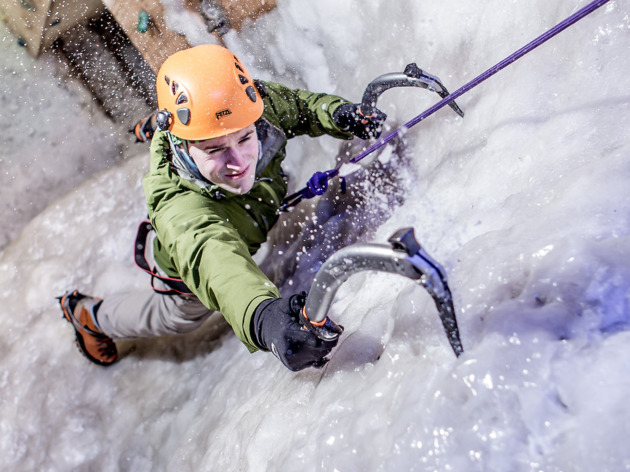 With ice axes, crampons (or studded boots to you and me) and help of a trained instructor you can spend an hour climbing Vertical Chill’s many ice walls. From around £35, you’ll get all the exhilaration of reaching the peak of the world’s tallest mountain but without the diet of freeze dried meals and perilous drops. 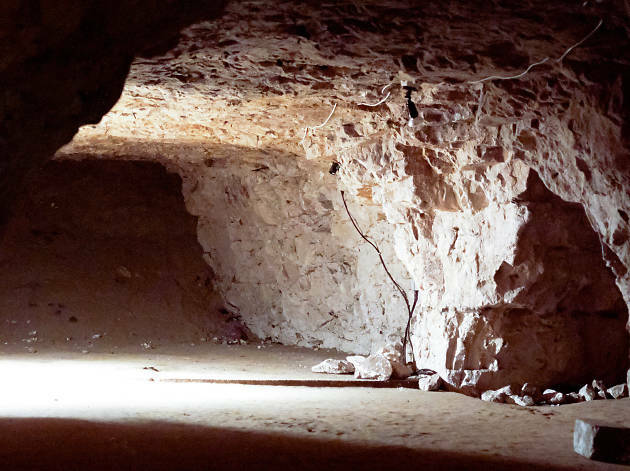 Have your very own extreme mountaineering experience right in the heart of Covent Garden. 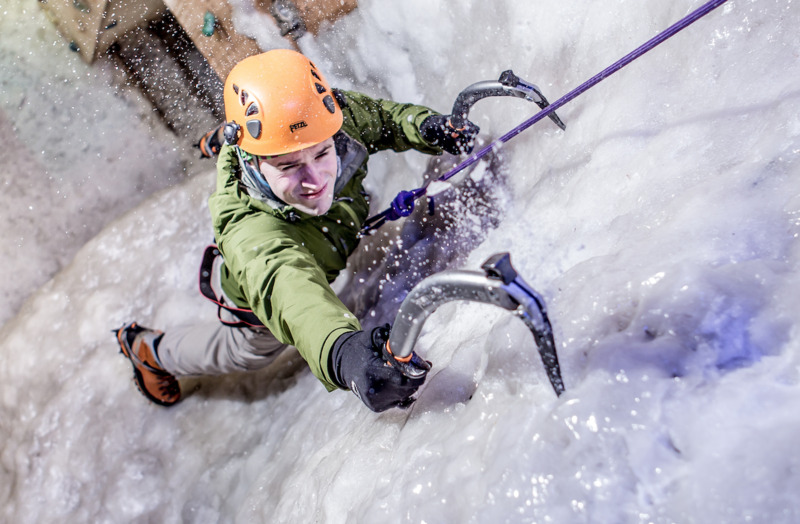 With ice axes, crampons and help of a trained instructor you can spend an hour climbing Verticle Chill’s ice walls. Topping up my tan on the shores of the Algarve. Okay, the capital’s rays may not be as strong the ones beating down on southern Portugal, but you can still find Mediterranean-style beaches and quiet, sandy coves without leaving Zone 5. Set on the edge of Ruislip Woods, this 60-acre lake is surrounded by golden sand and even a miniature railway. 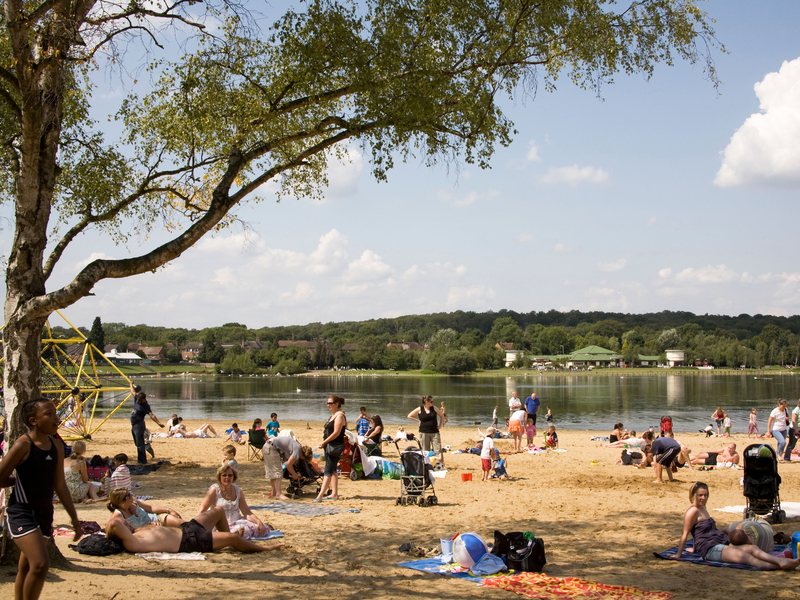 On a sunny day it makes for a pretty panorama with sunbathers and sandcastles. It’s like a scene out of ‘Summer Holiday’ minus Cliff Richard, which is probably a blessing for all concerned. Stranded on Indonesia’s Sunda Islands under the beady eye of a Komodo dragon. Hang on! I don’t like the sound of that. 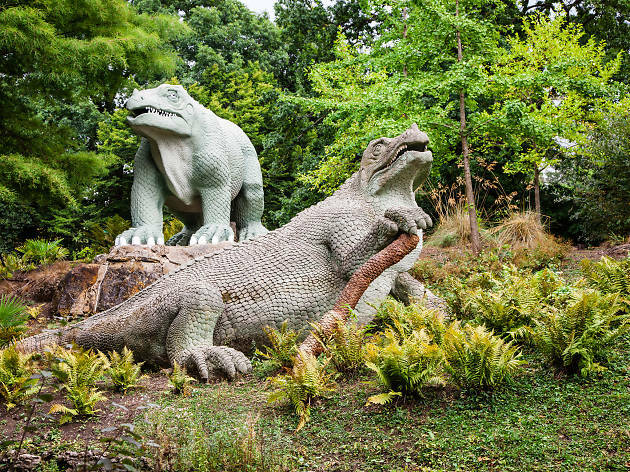 Don’t worry, you’re safe in south east London, but with 30 full-scale statues of the Komodo dragon’s dinosaur cousins to amble among it‘ll feel more ‘Jurassic Park’ than Crystal Palace Park. The not-particularly-accurate but nonetheless enchanting collection of concrete lizards dotted around park’s lakes are the remains of a Victorian theme park planned by Benjamin Waterhouse Hawkins in 1854. 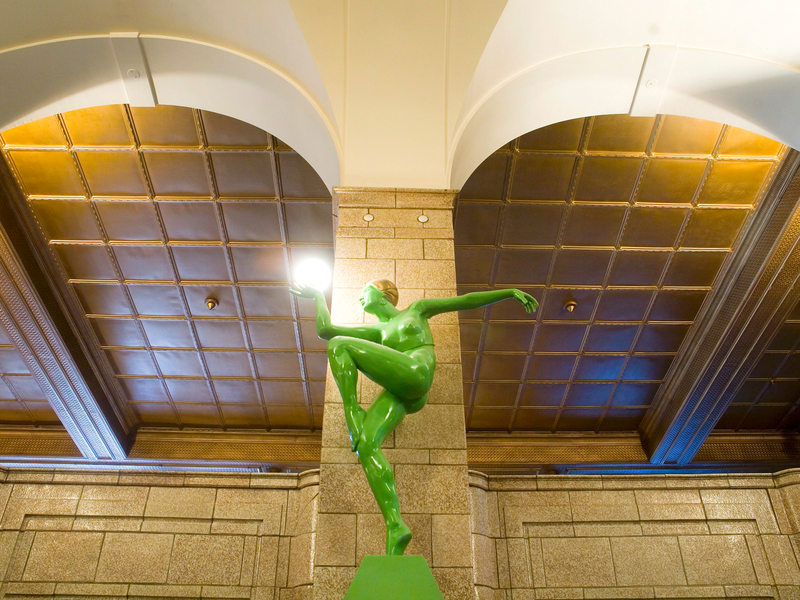 The statues were restored in 2003 and are now Grade I-listed. Channeling your inner Tolstoy with a good ol’ parenie. It’s an old-school Russian massage, which involves being swathed in hot wet leaves and pummeled by venik – a leafy bundle of herbs. It’s meant to reduce muscle tension and, er, stress and it’s the speciality treatment at Banya No 1 – the only traditional Russian baths in London. Unlike conventional saunas, the banya surrounds you with high levels of steam as water is splashed onto cast iron heated to 700C inside a brick furnace. Amid the pummelings you can also expect plenty of vodka shots and tasty Russian delicacies as part of the Slavonic experience. Having a nosey at Paleolithic drawings in the caves beneath the Dordogne. I can’t see any drawings? There may not be any Stone Age relics here, but 30m below Bromley borough are Chislehurst’s man-made caves, which were carved out of chalk by Druids, Saxons and Romans. 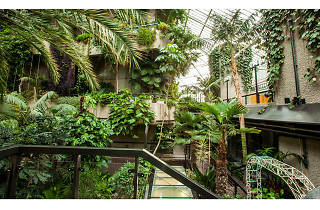 Over the years, they’ve been used for everything from providing bricks for London’s buildings, a WWII bomb shelter and an underground music venue hosting the likes of Jimi Hendrix, David Bowie and Led Zeppelin. 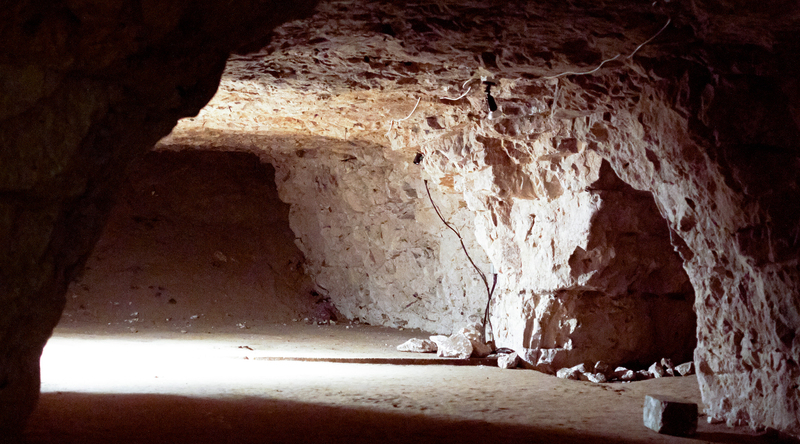 Go on a lamp-lit tour through the labyrinthine space and see the Druid Altar, the Caves’ Church and the Haunted Pool. Spooky. All steamed-up in the thermal waters of one of Budapest’s bathhouses. It is, and even more so because you didn’t spend hundreds of pounds on flights to get there. You’re actually soaking in the warm water jets of Porchester Spa, housed in a spectacular 1920s building on Queensway. Filled with opulent art deco architecture, stylish tiles and brown leather benches, the stylish interior has all the shabby-chic grandeur of Hungary’s thermal spas. What’s more – it’s one of the most affordable spas in the capital. 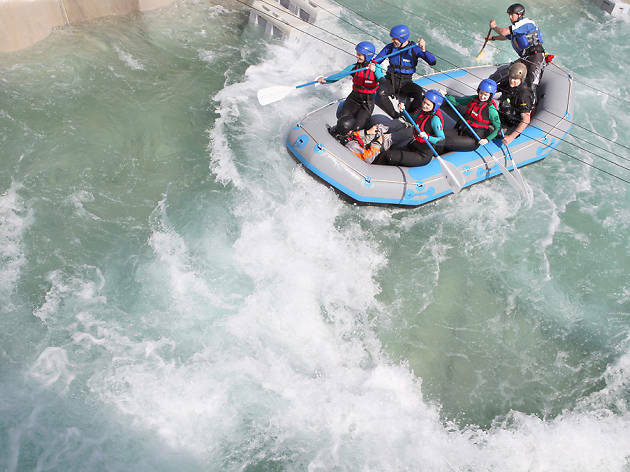 White-water rafting down the Zambezi. OK, so a little imagination might be necessary for this one: Lee Valley White Water Centre, with its concrete banks and overhead pylons, has all the ingredients of the Zambezi River. 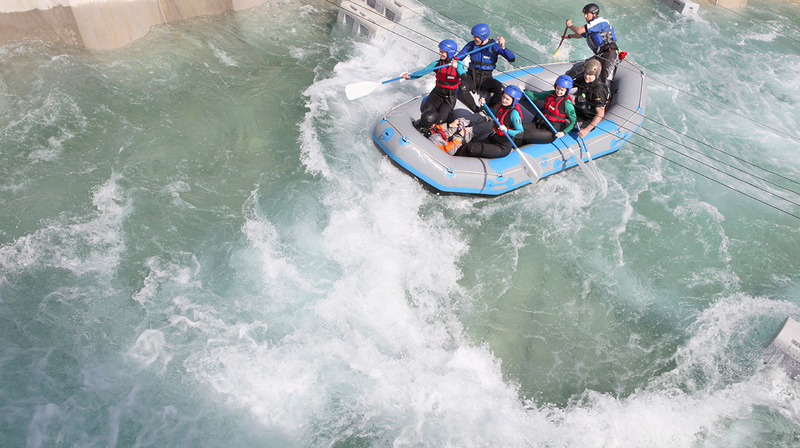 There’s water, just like the Zambezi, you can raft down its drops and rapids, just as you can in the Zambezi. We will concede a few major differences, such as the lack of greenery, cold weather and no giant snapping fish to eat you if you fall in, but all for the better, eh? Great! I can get myself a new Tamagotchi! No, you’re not in the ’80s, you’re in the Japan Centre. If you ever find yourself in the position of having to fabricate a trip to Japan, this is the ticket. Head to Shaftesbury Avenue where you can get your paws on some serious sushi, try imported specialty drinks like the alluringly named ‘Pocari Sweat’ and pick up ‘souvenirs’ like Japanese-language books and Manga. Take some snaps and no-one will be any the wiser. The Cathedral of the Nativity Of the Most Holy Mother of God and the Royal Martyrs. Catchy. Anything easier to remember it by? 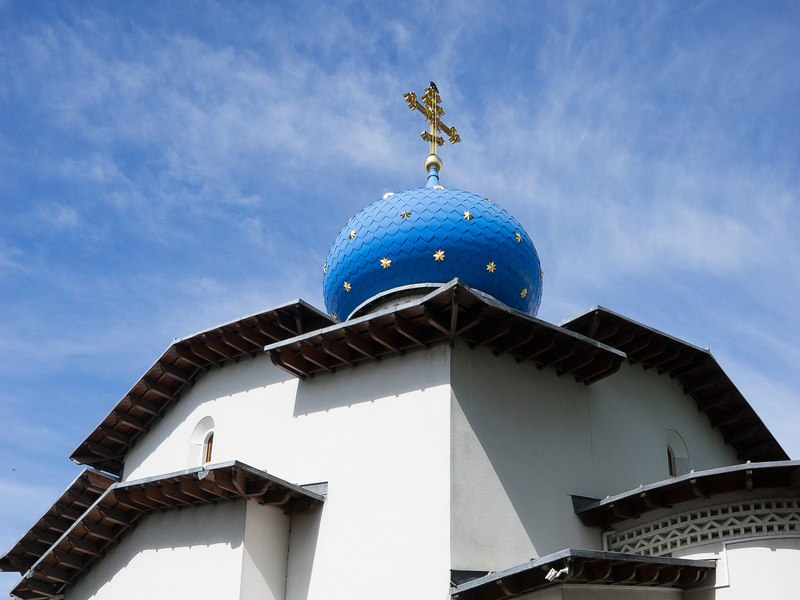 Yes, you’re looking at a Russian Orthodox Church, for short. The bright blue dome and gleaming gold cross that rise over the rooftops of Chiswick are a little slice of St Petersburg in west London. The inside is just as impressive as the exterior: ornate wood carvings are interspersed with religious iconography. Services are mostly held in Slavonic (the language of the Russian Orthodox mass) but, if your Slavonic’s a bit rusty, the Sunday liturgy is in Russian with a simultaneous translation into English. Relaxing in a luxuriously tiled Turkish palace after a long day haggling at the bazaar. Bazaar? You mean Westfield don’t you? Yes! Because – gasp – you’re not in Istanbul at all, you’re in Holland Park. 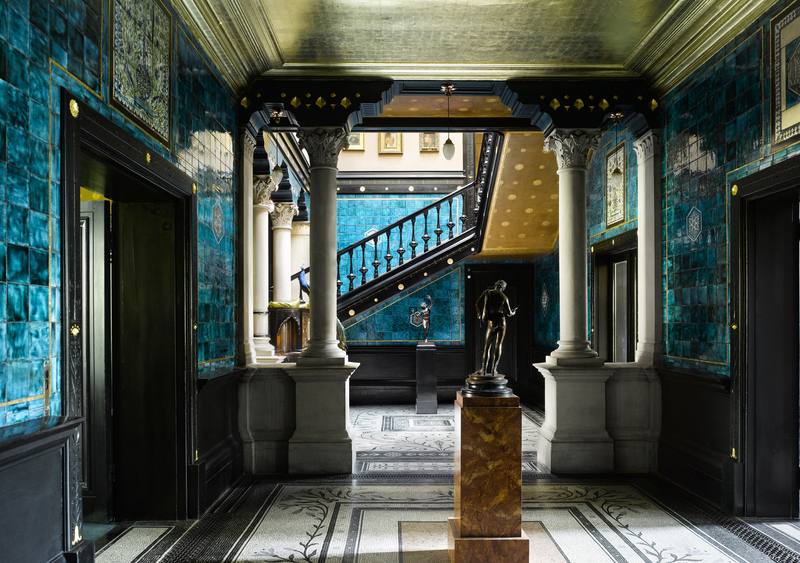 Leighton House Museum, the former home and studio of Pre-Raphaelite painter Frederic Leighton is described as the place ‘where east meets west’, and it turns out they get along famously. The house and studio are filled with the artist’s paintings in different states of completion. But it’s the ‘Arab Hall’ that’s the real jaw-dropper. This big domed room covered in tiles and mosaics from across the Med will make you forget which continent you’re standing on. Where am I? Shaking your tail feather to some of the finest rock ’n’ roll hits of the 1950s in a lush gold and velvet ballroom. Hey, is that Elvis over there? Don’t be daft, Elvis may still be alive (and an alien), but he doesn’t hang out in Brockley. 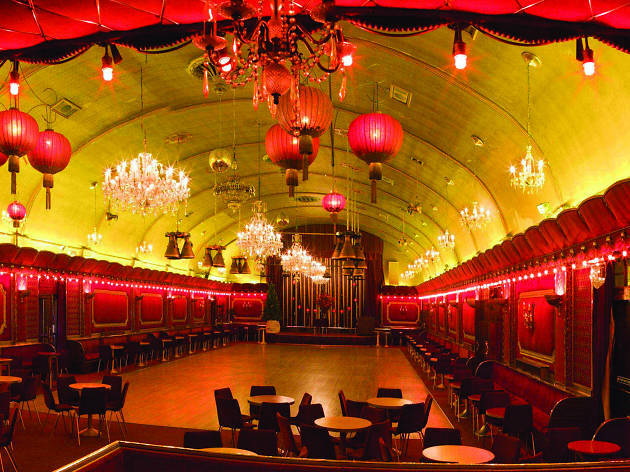 Which is a shame, because he’s missing out on the Rivoli Ballroom, London’s last remaining mid-century dancehall. Covered floor-to-ceiling in red velvet, it’s the very definition of plush hedonism. Combined with the ornate Austrian chandeliers, huge Chinese lanterns, glitterballs and art deco-accurate décor, it all makes for one of the most realistically retro nights out you could wish for. You're naked and sweaty and surrounded by strangers. Don't sweat it, you're only in a sauna. The Finns are into stripping off and sweating out their impurities. 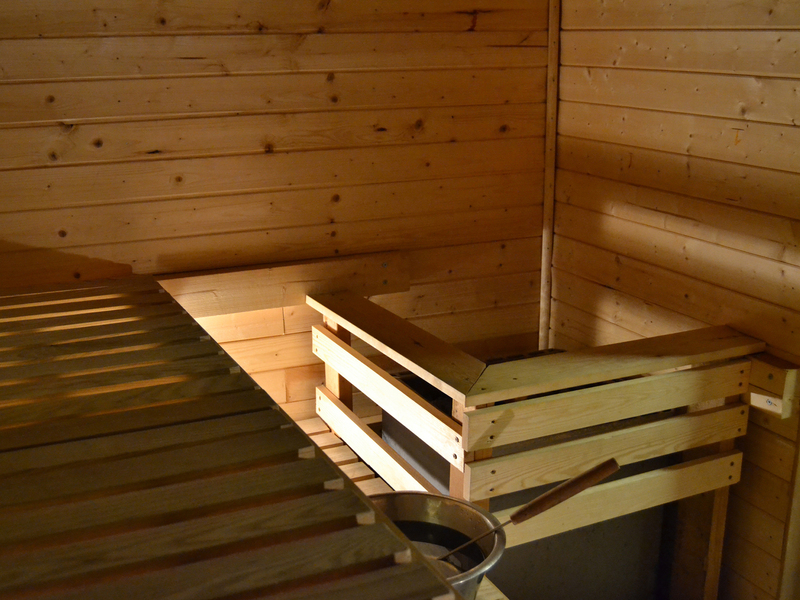 So much so, there’s even a special debating sauna in the Finnish parliament. You can get an authentic Scandinavian legislative experience without venturing outside the M25 (although you will have to go to Rotherhithe). For just £6 you can sit naked in a traditional wooden sauna and perspire with strangers; sessions are separated by gender unless you book a private slot. Even then, we’d say it’s a pretty ballsy first-date suggestion. At a beautiful Hindu temple. Its polished marble surfaces, ornate columns and vaulted ceilings create the ideal space for quiet, contemplative prayer. Hold on a second, I can see Wembley Stadium. This isn’t India! No, it’s Neasden, and it’s lovely. 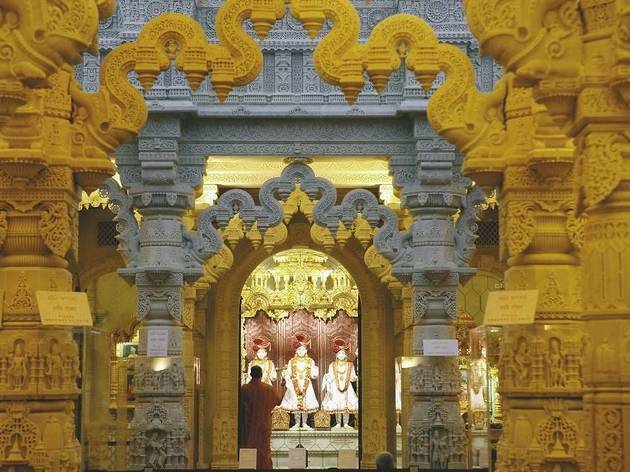 Shri Swaminarayan Mandir is one of the biggest Hindu temples outside India. It was built out of 3,000 tonnes of Bulgarian limestone and 1,200 tonnes of Italian marble, all of which was hand-carved in India before being assembled in its present spot, like giant Lego. 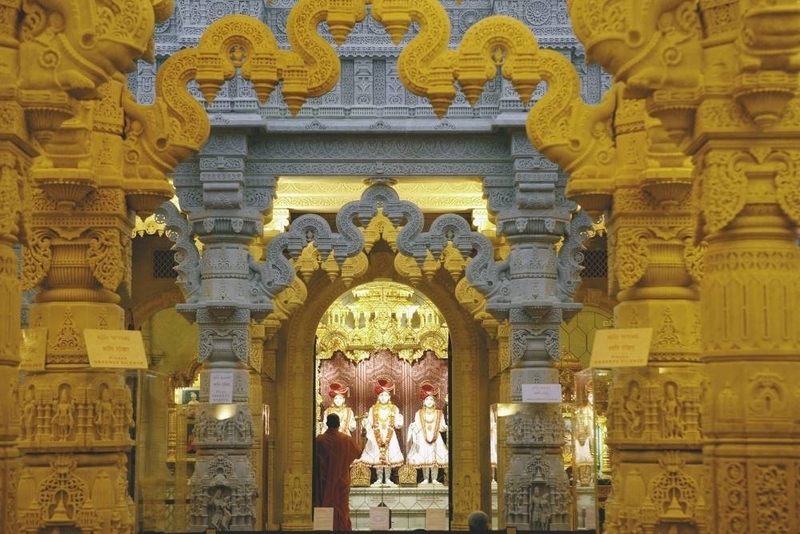 Once you’ve walked up the glistening steps and entered the main space, filled with intricate carvings and shrines to Hindu deities, you’ll feel instantly transported. Deep in the macabre skull-adorned tunnels of the Paris Catacombs. Skulls! Don’t think I like the sound of that! Chill out mate. 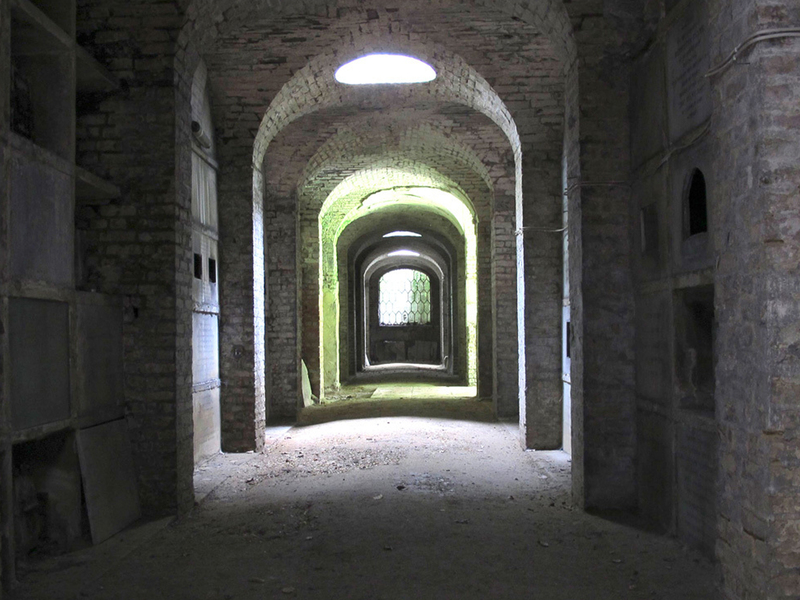 You’re actually in Highgate Cemetery’s catacombs, which although creepy bypass the human remains. 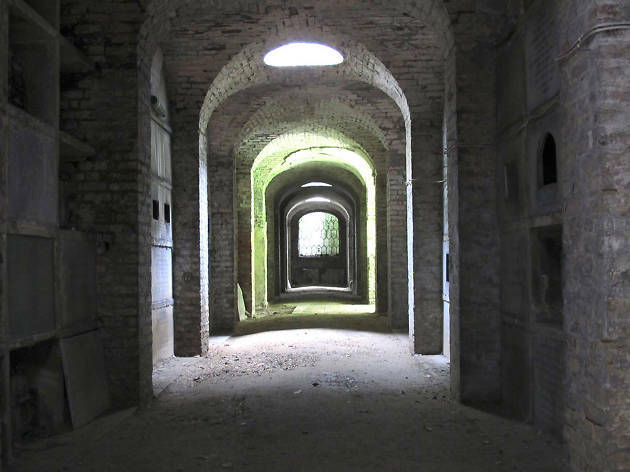 Wind your way up the snaking path through the looming trees to the Terrace Catacombs entrance and see the immense gothic multi-tomb inside. Marvel at the beautiful Victorian architecture and explore the rest of this beautiful cemetery where the likes of Karl Marx and George Eliot are buried. It’s dead good. Where am I? Sunning yourself on a tropical island, a gentle breeze wafting through the palm trees as you wiggle your toes in a pond full of exotic fish. Joke! You’re in the Barbican, and you definitely aren’t allowed to dip your toes into the fish pond. 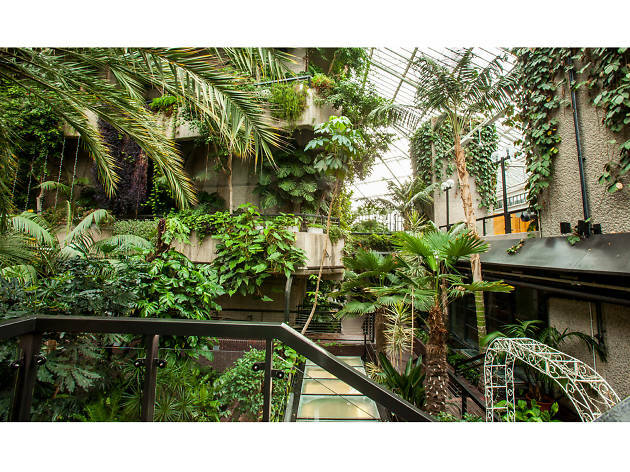 In the maze of this brutalist masterpiece, the Barbican Centre’s conservatory is a hidden oasis. 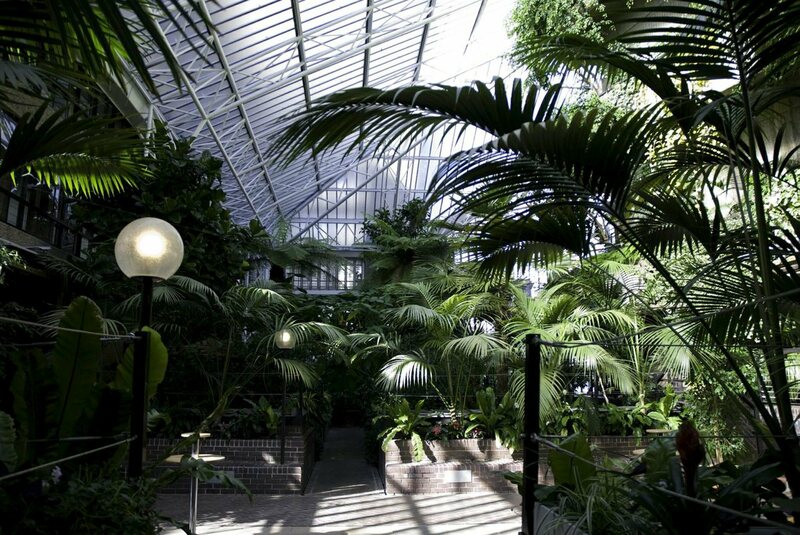 Filled with over 2,000 species of exotic plants that tumble over the concrete balustrades, it’s made all the more brilliant by how unexpected it is. 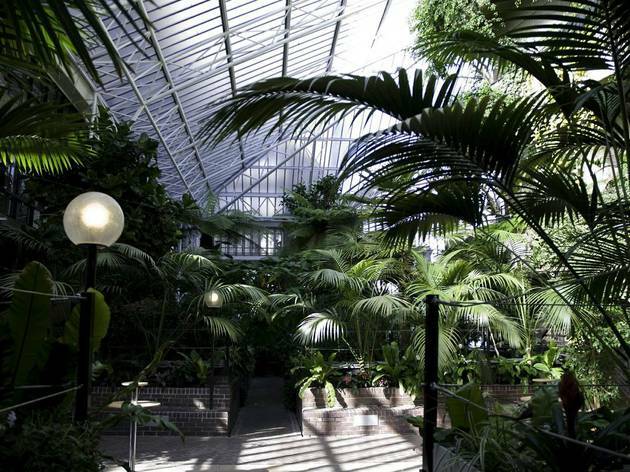 There are few better places to escape London for a bit of tropical serenity. Tucked away in an Iranian grotto, guzzling cardamom tea and feasting on dried lime stew. 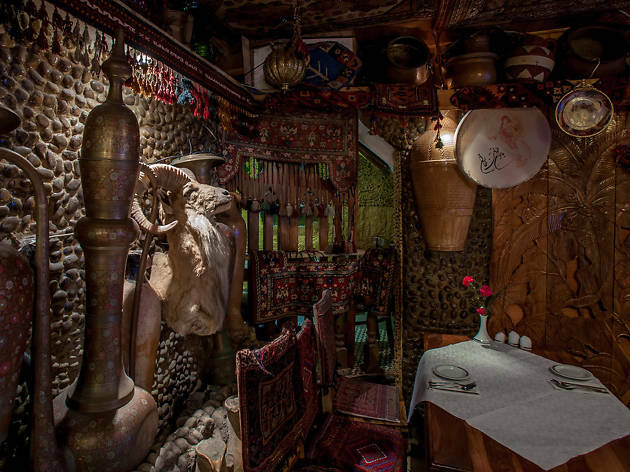 Okay fine, you’re on the Harrow Road, but once you’ve walked through the doors of Behesht restaurant and found your way through the rabbit warren of rooms to your table, you’ll think you’re partying in downtown Tehran. This place is a treasure trove of Persian fancies – art and musical instruments, parrots cawing in cages. There’s even a pond! Coupled with some of the best Iranian food in the city, Behesht is a seriously sensory experience. Where am I? 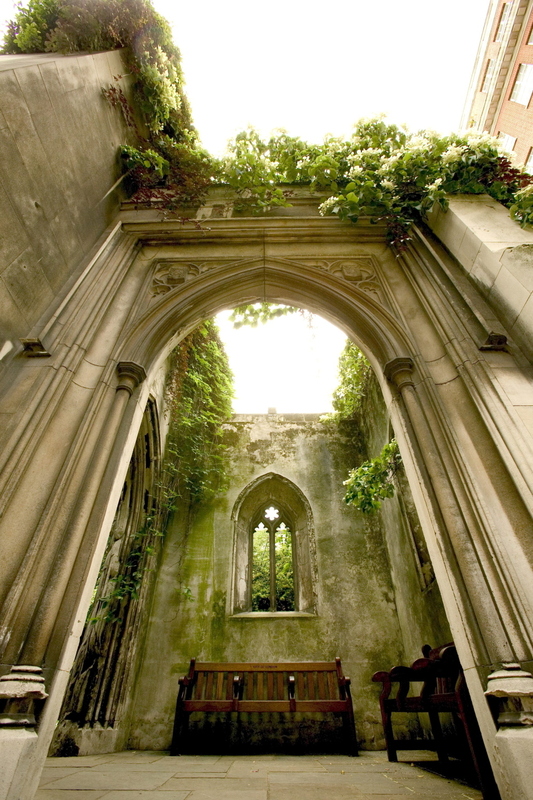 A secret garden in the bombed-out shell of a former church with gorgeous ivy and flowers growing out of the picturesque ruins. Don’t worry, it’s all structurally sound and totally idyllic. The first St Dunstan-in-the-East was built on this site, a stone’s throw from the Tower of London, way back around 1100, then Sir Christopher Wren added a tower in 1700. 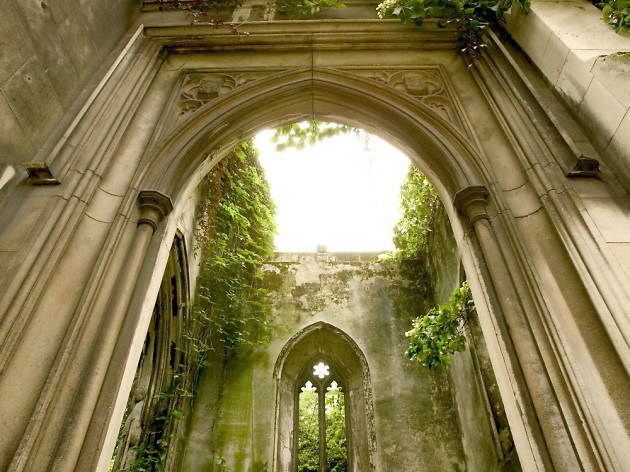 The church got blitzed to bits in 1941, but rather than rebuild it, or knock it down and put a Pret a Manger there (they would’ve, but there weren’t Prets in 1945), they converted the hauntingly pretty shell into a quiet green space in the middle of The City. The tower still watches over the garden, and it’s become a little escape from all the suits rushing around outside. Where am I? You're bird-spotting among the reeds and the seabuckthorn in the marshlands of Norfolk. Norfolk doesn't sound very exotic. Oh really? Well how's west London for you? 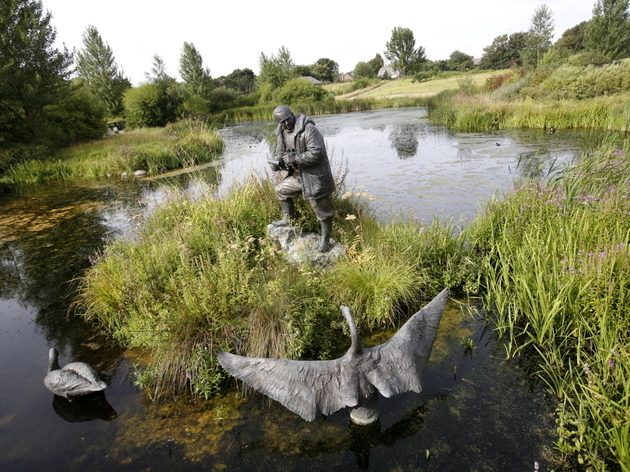 It might not be the most other-worldly experience, but a day out in the London Wetland Centre is a day well spent. Let loose your inner Bill Oddie and settle into one of their six hides, where you can spot the likes of American wood ducks, elegant smews, playful otters, and wading birds. Get involved and help the warden feed the birds at 3pm on weekends, or meet the otters and learning about their breeding programme daily at 11am and 2pm.